Honey is a versatile food to have at hand. It is a sweetener and it boasts many medicinal properties. Many honey consumers also use it as an energy booster. Once harvested, honey can be stored in many ways. Beekeepers can store honey before selling it to consumers. You may also buy honey and store some for your use at home. In honey storage, temperature and moisture are the two most important things to consider. The best way to store honey is to keep it away from contact with moisture and prevent high temperatures, or fluctuations in temperature ranges. Honey can be stored in various forms. Beekeepers may keep it in honeycomb until they are ready to extract it. They may also extract the honey and store it in various containers. Consumers often get extracted honey. 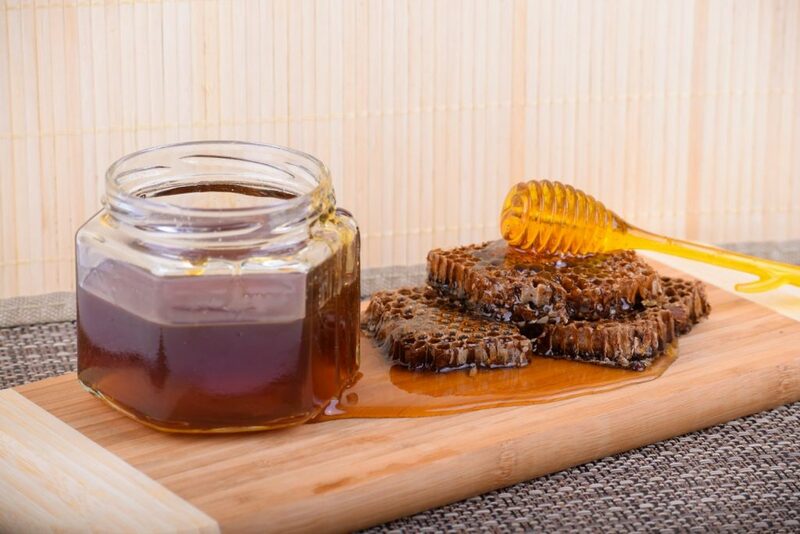 In recent years, consumers may get honey in its wax combs and extract it by themselves. Storage for honey in honeycomb varies slightly from storage of liquid honey. The two factors – moisture and temperature are however constant considerations when storing honey in any form. Storage of honey requires adequate preparation. You should set apart some space for your honey storage needs. The space could be cooled or just a place in your house that is not subject to large temperature ranges. Honey crystallization is accelerated by cool temperatures. This is a natural process that is reversible. Crystallized honey is safe for consumption. It can be returned to its more liquid state by warming it gently. Too much heating of crystallized honey destroys the nutrients found in honey. You should also not subject honey to more than one crystallization and warming cycle. If you do, you will have honey with its sweetening properties but lose all the micro-nutrients and volatile compounds that are found in it. Food-safe plastic and glass are the best and common storage container materials for honey storage. In the past, sealable earthenware pots were used to store honey. The best way to store honey is in a plastic sealable container or glass sealable container. The containers you will use to store honey should also be clean and dry before you put honey in them. Mason jars made using glass are loved by most homeowners and beekeepers for storing honey. They allow you to see how the honey in the jar looks as well as monitor crystallization. Honey should be put in a cool, dry place away from sunlight. The temperature at which you store honey determines whether the honey will crystallize or not. When storing honey, keep it away from appliances that produce heat such as stoves. If your house tends to warm up in the day, find the coolest part and use it as your honey storage area. Furthermore, you do not have to refrigerate honey during storage. Honey that is stored at room temperature is easier to handle that that which is kept at cold temperature. Freezing is also used in honey storage. To store honey in frozen state, put it in a container and leave some allowance for expansion. Place the container with honey in a freezer and the honey will stay fresh for long. Frozen honey does not in reality freeze solid due to very low moisture content of honey. Honey is largely sugars suspended in 18% moisture or lower. This prevents honey from freezing solid but it becomes very thick and viscous. When thawing out frozen honey, do not heat it directly. The best way to thaw honey is by indirect application of heat. Place the container with honey in warm water and allow it to sit for some time. The honey gets warmed by the water and becomes less viscous. You may heat the water if it gets cooled down too much by the cold frozen honey. Only thaw out the amount of honey you are going to consume in a short period of time. The use of metal containers in food storage has attracted a lot of scrutiny. While food grade metals are approved for use with food for human consumption, the use of metal containers in storing honey is however discouraged. Long-term interaction between honey and metal surfaces results in oxidation of some of the honey. It gives your honey a sharp metallic odor and taste. The safety of such honey for consumption is not easy to ascertain. At the same time, metal implements are used in honey harvesting; these include uncapping knives and honey extractors that have metallic drums. However, the period of time that these metal parts or equipment are in contact with honey is small and not adequate for oxidation to take place. Exposing stored honey to light has an effect on it. It causes the honey to darken in color. Additionally, exposure to sunlight may warm the honey and cause increases in levels of hydroxymethyl furfuraldehyde (HMF). A cupboard or kitchen pantry is the best place to store honey if you are not going to freeze it. You should never refrigerate honey. This is because refrigerators see large temperature drops and rises which are not good for stored honey. Beekeepers selling honey may decide to harvest comb and store honey in it. Customers may also buy the honey before it is extracted from honeycomb and store it. To store honey in comb, it is best removed from beehive frames. The comb is cut with a sharp knife along the edges where it attaches to the beehive frame. The comb is left capped and stored in tight plastic wrapping or in sealed containers. You may freeze the honeycomb or leave it in a cool dry place away from sunlight. Thawing out the honey for extraction is done by placing the comb in a warm space. Allow the honeycomb to warm before unwrapping them if you had used plastic wrapping during storage. For those who place the honeycomb in sealed glass or plastic containers, allow the container to get warm enough before opening it. Cold honeycomb causes condensation to form on its surface. The condensation cannot reach honey in capped honey cells, but it makes it cumbersome to work with the honeycomb. Additionally, the condensation may get onto honey as you extract it and alter the moisture content of your honey. Honey stored in honeycomb remains fresh due to the natural preservation. It does not crystallize easily or go bad. Unfortunately, not many consumers of honey do not have the equipment required to extract honey from the honeycomb. This limits them from purchasing honey in honeycomb and storing it. Beekeepers with honey extraction equipment are thus better suited to store honey in honeycomb. They may leave the honeycomb attached to beehive frames. If you are going to cut honeycomb from beehive frames for sale or storage, make sure to use unwired frames. Additionally, the frames will have to be either foundationless or use wax foundation. Stored honey may undergo some changes during storage. Not all changes in stored honey cause or are indicators of spoilage. Crystallization is one of the changes that can happen in stored honey. You will notice a change in the consistency of honey when crystallization happens. The process of crystallization starts with sugar molecules in honey aligning themselves into stable chains and blocks. The chains and blocks attach to each other and form crystals. Crystals in stored honey may be large or small ones. The crystals settle at the bottom of the honey container. A transparent honey storage container allows you to see crystallization in its various stages. There are two types of crystals formed in stored honey. Large crystals settle at the bottom of your honey container. Small crystals may remain suspended in the honey. Stored honey that has formed small crystals is called creamed honey. It is achieved by storing honey at a temperature around 13.90 C. Creamed honey is easy to spread and has good consistency. Raw honey from beekeepers that do not process or super-filter honey is more likely to form crystals. High pollen content in honey causes faster crystallization than in low-pollen honey. Low temperatures also cause faster crystallization in stored honey. A marked difference is seen in the size of sugar crystals formed in honey stored at different temperatures. Lower temperatures lead to formation of larger crystals. This trend continues until the temperature reaches -40 C and honey freezes. Honey stored at a temperature where water typically freezes does not crystallize. The type and size of container you use to store honey does not affect crystallization. Materials used to make containers also have no effect on the crystallization of honey. Beekeepers and consumers of honey who do not want their stored honey to crystallize should store honey at room temperature. This keeps sugars dissolved within the honey. The low moisture content of honey makes it a saturated solution. At cold storage temperatures, honey loses its ability to keep sugars dissolved and speeds up crystallization. As such, a dark and dry cabinet in a room should work fine for storage of honey when you do not want it to crystallize. The cabinet does not need to be cooled or warmed. Some beekeepers intentionally produce crystallized honey and market it as such. They serve the demand for crystallized honey from some consumers of honey. This goes to show that the crystallization of honey is not necessarily a bad thing. However, the crystallized honey is frowned upon by some honey consumers as it is difficult to use. It is thick and too sticky on scoops. Thawing out crystallized honey is also tedious and can result in loss of nutrients from the crystallized honey. It is also not recommended to use a microwave to thaw out crystallized honey. If honey crystallizes, you can return it to a more liquid and less viscous state. To do this, simply place the honey container in hot water. Stir the water and gently heat it if necessary, but do not make it too hot. Too much heat application to honey causes caramelization of the honey. It alters the color and flavor of your honey. 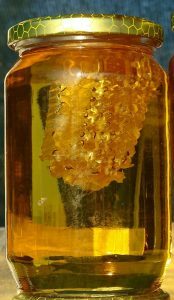 When you re-liquefy crystallized honey, do not allow it to crystallize again. Subjecting honey to cycles of crystallization and liquefying is not advisable. Raw honey is that which has not been super-filtered, processed or heated. It can have been extracted using a honey extractor and sieved without application of pressure. Raw honey is unique every year due to differences in the flowers that bloom. Beekeepers sell raw honey as ‘table honey’ in some of their branding and labeling. Lovers of raw honey who cannot keep bees should find a reliable beekeeper that sells it. Honey in its raw form has little moisture content and is very hygroscopic. It attracts water and can ferment as a result. You need to store raw honey properly once you open the container. Raw honey containers may be glass or plastic. They should be sealable and not allow water or air into the container. Raw honey storage and use follows the same basic principles. After opening containers of raw honey, scoop out what you need and seal the container again. Minimum exposure of honey to air reduces the amount of moisture that the honey can absorb from the air’s humidity. It also prevents harmful yeasts from settling on the honey and fermenting it. The honey should be kept in a cool, dry place to slow down any fermentation. You should also use up the contents of an opened raw honey container as soon as you can. Avoid opening more than one container of your raw honey at a time. Opening more than one container exposes the honey to a greater risk of going bad. When you are done with one container, you may open another. It is also advisable to use wide mouth jars and containers for raw honey storage. These allow for easy scooping of honey when you want to use some. 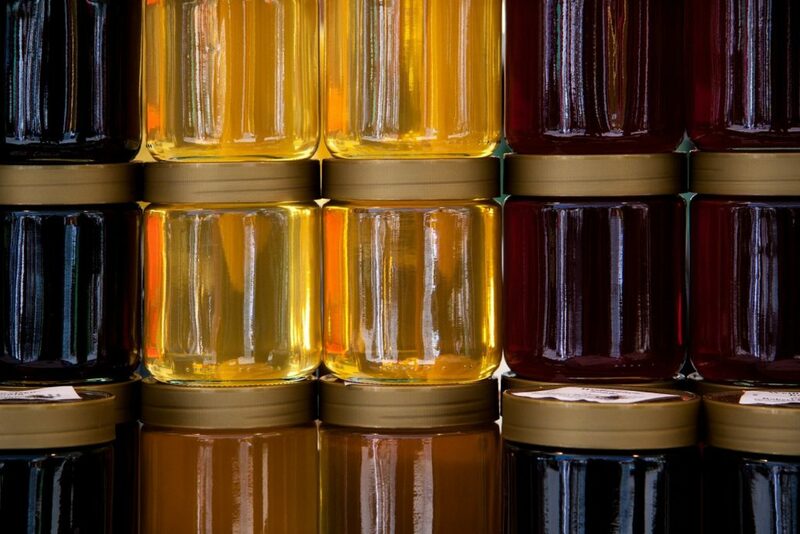 There are many sealable plastic and glass jars available for honey storage. Buy a number of these containers for your honey storage needs. If you have a lot of raw honey stored, it will most likely be in large containers. When you open these containers, a lot of the raw honey gets at risk of spoiling. To get around this, you should invest in smaller containers. Scoop out some honey into the smaller container for use. You can measure out the honey you use for a week into the smaller container. The smaller container gets opened more frequently as you use the honey. This reduces the amount of honey that is at risk of going bad. When the smaller honey container is emptied, refill it from the last opened larger raw honey container in storage. Store opened raw honey at room temperature near where you use it. Room temperature works best with honey storage. Honey in the opened container stays liquid at room temperature and is easy to scoop out when you want to use. Refrigerating raw honey causes it to crystallize and difficult to scoop out. You will need to warm it up a little and possibly destroy the nutrients in the honey. Additionally, keep raw honey in opened containers in the dark if possible. Natural beehive conditions are dark. Exposure to light causes raw honey to darken. Raw honey may come in honeycomb. Beekeepers and other honey consumers love chewing the honeycomb and getting the honey out. Some raw honey packers may also include a piece of honeycomb in their honey jars. This honeycomb makes raw honey crystallize faster. You may remove the comb if you do not want your raw honey to crystallize. If your raw honey comes in comb, you may freeze the comb. At extremely low temperatures, honey does not crystallize. It only gets more viscous. Before freezing raw honey, make sure to leave room for a little expansion in the container. For raw honey in comb, wrap the comb in plastic paper that will not allow moisture in. You may cut the raw honey comb into smaller pieces and freeze them on a plate. Once they are frozen, use a food sealer to pack each section of the honeycomb in a vacuum. This way, no ice crystals will form on the comb and ruin it in storage. You can then use the frozen comb in small amounts as you like. Frozen honeycomb thaws out and is ready for use in a few hours at room temperature. Mason jars are molded glass jars that are popular in home canning for food preservation. They are named after their inventor John Landis Mason, who took out a patent on the jars in 1858. A Mason jar has a screw thread on its mouth’s outer perimeter. The thread accepts a metal ring or band. Today, soda-lime glass is largely used to make Mason jars. When screwed down, the band of a Mason jar presses down a stamped steel lid on the jar’s rim. The steel lid is disc-shaped and often tin-plated. On the underside of the lid is an integral rubber ring that creates the famous hermetic sealing of Mason jars. Bands and lids mostly come with new jars, but you can buy them from various suppliers separately. The bands for sealing Mason jars are reusable but the lids are made for single use in canning. Mason jars have been overtaken by other methods and products in commercial canning but remain a favorite in honey storage. This is because the glass used to make the jar does not react with honey and oxidize it. However, make sure to use plastic or rubber liners with the metal lid of Mason jars or leave some head space. Honey stored in a Mason jar should not come into contact with the metal lid. There are two common sizes of Mason jars used in honey storage. They are named ‘regular mouth’ and ‘wide mouth’. The regular mouth Mason jar for honey storage has an inner diameter of 60mm and an outer diameter of 70mm. Wide mouth Mason jars have the inner diameter at 76mm and the outer diameter 86mm. They have varying heights to accommodate different volumes from half a pint to half a gallon in imperial units. Some Mason jars you may find available for purchase have their capacities in metric units and range from 125ml to 1 liter. Brands of Mason jars are often trademarked. Storing honey in Mason jars follows a slightly different procedure than that of other foods. Honey should not be subjected to heating unlike most other home-canned foods. When storing honey in Mason jars, you do not have to heat the jars. Honey is naturally resistant to microbial growth. If you fill the Mason jar well and leave just enough head space, the honey stays well preserved. To store honey properly in Mason jars, pour the honey into clean Mason jars and leave some head space. This is the space left between the level of honey and the top of the Mason jar. Next, place the lid on top of your Mason jar and seal it. Make sure that the integral rubber seal rests properly on the rim of each jar. Screw the jar’s band loosely over the Mason jar lid. You may later remove the band from the lid or leave it in place. If you do not use heating to create negative pressure in the Mason jar, it is best to leave the band in place. You may additionally opt to go the whole route and use heat in the Mason jar when storing honey in it. For this, use a hot air blower to heat the top part of the jar that is not in contact with honey and then seal the jar immediately. Remove the hot air blower from near the Mason jar to allow it to cool. This achieves some negative pressure inside the jar when the hot air in the jar cools down. Wide mouth to make scooping of honey easy. Good sealing that ensures honey will not absorb moisture from the air around it. Able to be frozen without breaking. Available in different sizes to suit varying customer preferences. Comes in a variety of lid colors to match your kitchenware. Honey stored in Mason jars is subject to environmental variables such as heat and light. Mason jars are transparent and will let light through to your stored honey. They are thick and insulate honey to some extent but eventually conduct heat to the contents in the jar. Storing honey in Mason jars will thus need you to keep the honey at room temperature and away from light sources. You may freeze honey in Mason jars if that is your style. Mason jars are also clear, allowing you to see the color and state of the honey you have stored in the jar. Modern Mason jars have domed lids. Proper sealing causes the lid to form a concave dome. Improper sealing or microbial growth in the stored contents within a Mason jar causes the dome to pop upward into a convex shape. Storing honey in Mason jars is largely up to the individual. If you do not have access to Mason jars you could use alternative sealable glass jars. Exposed honey attracts ants due to the sugars it contains. In a beehive, ants are deterred from stealing honey due to how hot it is inside. They are also attacked and killed by bees when detected in the beehive. In storage, honey may attract ants without you noticing it. Ants eat the honey and often ferry some back to their nests to be used as food reserves. There is nothing worse than finding ants all over your stored honey and some possibly drowned in it. Here are a few tips on how to store honey away from ants. Ants have scouts looking for food all the time. When a single scout finds your stored honey and can access it, it carries some back to the colony. This leaves a chemical trail leading back to your honey. Tight seals on stored honey containers make sure that scout ants cannot access the honey. Additionally, they cannot detect the odor of honey using their antennae. Storing honey in containers means that you will at some time scoop or pour out honey. Some honey may run down the sides of your honey container after pouring or scooping out what you need. Honey on the sides of the container will attract ants to the honey. To prevent this, use a wet cloth to wipe off any honey on the sides of honey storage containers. Homeowners use various methods to kill, trap and deter ants from their homes. You can use some of these methods to keep your stored honey safe too. Deterrents used around the house such as insecticides, chalk and lime will keep ants away from stored honey in the house. A mixture of 1 part vinegar and 1 part water is great for use as an ant deterrent. Use the mixture to wipe down surfaces in your honey storage area. The outer surfaces of your honey storage containers can also benefit from a wipe-down with the mixture. For more potency, you may add some cayenne pepper, lemon juice, cinnamon, garlic cloves, black pepper or red pepper to the mixture. These spices also have ability to repel ants due to their spicy, pungent or bitter smells and tastes. If you detect an invasion of ants in your stored honey, you will be able to deal with it early and reduce losses. Honey stored in freezers is at very low risk of being discovered and eaten by ants. This is because ants will avoid any places with extremely low temperatures such as a freezer. If you miss these preventive steps and find ants in your honey, you can usually salvage some of the honey. Use a scoop or spoon to decontaminate the honey by plucking them out carefully. You should make sure to scoop out the whole ant, without leaving parts of its body in honey. Using hot air is another way to clear ants from your honey. Hot air kills most ants or makes them flee. They will leave your honey free of ants. You should be sure to find out the reason ants were able to reach your honey immediately and resolve it. You may find your honey container has a sell-by date. In most cases, producers and sellers of honey add two years to the date of production and use it as the arbitrary sell-by date. This is done as a practical measure towards honey safety and quality assurance. Beekeepers that package their honey after harvesting it and sell to retailers may have longer sell-by dates. Honey that is packaged well and stored in proper conditions remains stable for decades and has an infinite shelf life. Stored honey remains safe for consumption and nutritious for many years on end. With proper storage, honey does not ferment. This is due to its high concentration of sugars and slight acidity that does not allow bacteria to thrive on honey. Honey that is stored in cool conditions retains its nutritious components preserved in it. Use the detailed best practices on how to store honey for your preservation needs.